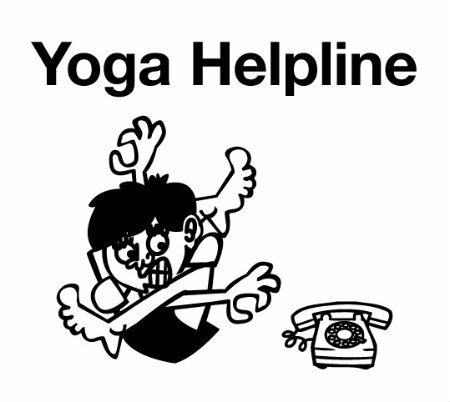 Welcome to Yoga Manchester’s first Yoga Helpline feature. Every month, we’ll be providing useful tips and advice on subjects relating to your yoga and meditation practice. Please send in any questions you may have and we’ll do our best to shed some light on your query! Q: Should I continue to practise yoga when I’m injured? A: To practise or not to practise asana during an injury is a difficult question and unfortunately is not straightforward. While we can suffer from similar injuries, i.e. hamstring strain or shoulder pain, the causes of these is almost always unique with the continuation of yoga practise to be determined by the individual. It was only a month or so ago that I received my first yoga injury, and by this I don’t mean a twinge or ache – these are ‘normal’ sensations for regular practitioners – but rather a sharp pain that continued long after the practice was over. Like many people, there’s nothing that pleases me more than to be told how to ‘fix it’, a ‘top ten tips’ on how to solve a problem, which led me to search high and low for an answer to the conundrum of whether to continue, stop or modify the practice. I could find was typically yogic responses of “it’s ultimately up to you.” Yes, this was frustrating at first but then I realised it was my Western mindset not the advice that was lacking clarity. Without the information available, I was forced to truly listen to my body and its actual capability as opposed to adhering to the prescribed one-size-fits-all advice. Without boring you with the details of my own trial and error experience, I honestly believe that our own inner guide is the most knowledgeable and in-touch with our needs right here and now. So, while a straightforward answer does not exist, here’s some guidance from well-known and respected yoga teachers. The teacher may point the way, but you are responsible for your choices. If you do experience increased pain, modify you practice as necessary rather than ignoring it and pushing through. Possibly this may mean stopping completely, alternatively it may mean continuing but at a greatly reduced pace. Working carefully and intelligently with injury is an important part of any yoga practice. Yoga should make the body healthier rather than harming it. Though one has to be intelligent rather than fanatical and mechanical. Having a good teacher to give guidance and feedback, and listening carefully to the internal cues that your body is giving you is very important. If you find yourself faced with a debilitating injury one of the hardest things to face is your own ego. The egoic mind hates to feel like it is slipping from the front of the pack and will cringe and twist when you lighten your load to go easy on your body. Just let the ego bleed itself to death…If you face a battle of ego when you modify your practice to be pain-free in your joints you can rest assured that you are absolutely doing the deep work of the spiritual path of yoga. Injury demands that you ask what your every-moment priority really is and requires you to be totally present. The question you must ask is at the core of your dedication to yoga. When you can no longer do the “cool” moves you must determine whether your motivation is truly finding inner peace or just the advanced postures. If you have an injury you should maintain practice, however, you should accommodate your practice in a way that facilitates healing. If you immobilize the injury too much, the scar tissue will lock up. You need to keep your blood flowing for healing to occur. If you overstretched something, continuing to overstretch will not facilitate healing. You may for a time have to change your approach to your practice, do not go as deep into the postures, modify them in some way, or leave certain postures and / or transitions out. Find the middle ground. Yoga should heal your body, not harm it. Talk to your teacher about the best way to work through a specific injury. It is important you do not stop practicing. There is also a mental aspect to the injury and if you do not keep moving and breathing you may not move through this. Breathe and move forward slowly and steadily with loving awareness. I’m a Yoga Teacher – Get Me Out of Here !